Sharda Sinha | OK Listen! Dr.Sharda Sinha, an exponent of folk music, has brought this neglected part of our cultural heritage the dignity and high seriousness of classical expression with warmth & spontaneity to the folk world. Smt.sinha was initiated into Indian classical music by the late pt. Raghu Jha, an eminent khayal singer of Panchgachiya Gharana. Her further training came from late Pt. Sitaram Hari Dandekar and Panna Devi, a thumri and dadra virtuoso & a contemporary of Begum Akhtar . 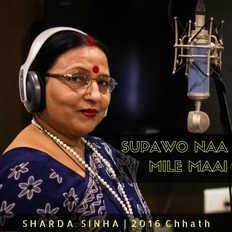 Dr. sinha an M.Mus (Indian classical Music-vocal ) and a Nritya Visharad (Manipuri) started making magic with her voice when she was almost a nonentity in the music world .With her debuton Maithili number “Dularua Bhaiya”she raised a storm which heralded the dawn of new era in the realm of folk music. A tribute to “Maithil Kokil Vidyapati” (HMV-1983) made her famous even in distant lands like Russia, china, the U K and the U S A . Her songs and lore on various aspects of social life have made her a byword for “Lok Geet” not only in the state but entire nation and abroad. Due to immense popularity and the purity of her songs sung on ‘The ‘Chhath Festival’ and ‘The weddings in north india’ , she is considered a synonym of Chhath Festival in Bihar and her wedding songs are inseparable part of the rituals . Her bhojpuri songs like “paniya ke jahaaj se“, “neelwa ke khetiya” and “suru bhail aandolan champaran se ” on the issues of Indentured labour under the Girmitiya act ,The Indigo Cultivation under The British rule and The Great Champaran Satyagrah respectively have been highly appreciated all over the country and the non-resident Indians all over the world. In a Cultural delegation led by the then Vice-president of India in 1988 , Dr. Sinha was invited to perform in Mauritius on the occasion of it’s 20th Anniversary of Independence. Smt.Sinha undertook many Cultural Tours in 2002 that were sponsored by the Indian Council for Cultural Relations (ICCR). As a part of these tours, she travelled across the globe to Germany, Belgium, Holland & Luxembourg where she performed live shows and presented the diversity and beauty of our rich folk music to NRIs and foreigners alike. 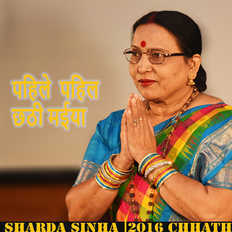 In the same year Dr.Sharda Sinha represented India in the ‘13th Ismailia Folklore Festival’ performing her Maithili, Bhojpuri and Magahi folk songs with mellifluous voice & subtle artistry. She was invited by the Ministry of Culture to perform in the 7th Vishwa Hindi Sammelan held in Suriname in the year 2003. Her traditional renditions of the Bhojpuri folk style awakened the past Indian memories in the hearts of Surinamese transporting them into realm of nostalgia. With an inimitable style Dr. Sinha has been rendering her folk songs at the All India Radio Concerts and Cultural Festivals across India for the last four decades. Her renditions are devoted to the promotion of folk music, increasing its popularity among masses and classes alike. A notable feature of her recital remains with the fact that it depicts various aspects of mythological, ceremonial and behavioral experiences inherent in the Indian folk music. Her numbers in the Hindi Block Busters “Maine pyar kiya” , “Hum Aapke Hain Kaun” , and Bhojpuri films “Mayee”, “BolBam”, “Dagabaaz balma”, “Sohagan Bana Da Sajna Hamaar”and “Deswa” have further endeared her countless people in India and abroad. Smt. Sharda Sinha is a “Top Grade” artist of Akashwani & the Head of the Department of Music , Women’s College, Samastipur (L.N.M.U.Darbhanga ) Bihar.